Meticulously kept home in Chestnut Hills, located on the 13th tee with expansive pond views. 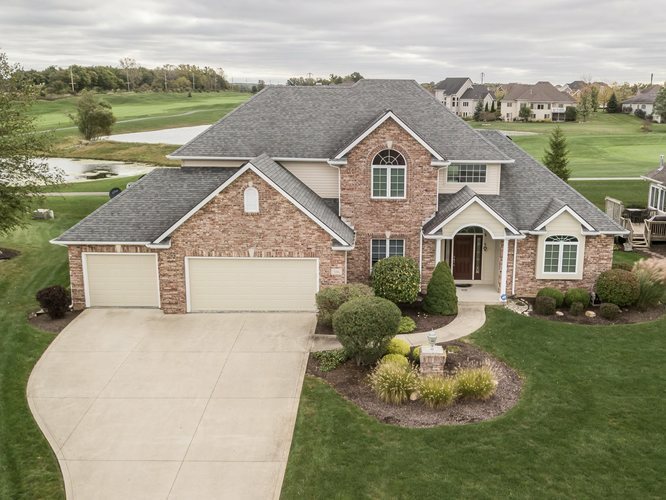 This home features about 4,362 sq. ft. with 4 bedrooms and 4.5 baths. Chef’s eat-in kitchen has granite counter tops, back splash, stainless appliances, gas range,custom cabinets, a pantry and hardwood floors. Master suite on the main floor includes a bath, walk-in shower and double vanity. Great room has high ceilings with a wall of windows and a gas fireplace. The den on the main floor can easily be converted back into a formal dining room. A 3 season room with access to a stamped concrete patio and fire pit is a perfect setting for entertaining or just relaxing and taking in the gorgeous view. Three bedrooms upstairs, one with its own bath the other bedrooms share a Jack N Jill bath. Relax or entertain in a large daylight basement that boasts a beautiful full wet bar, pool table, family room, full bath and an extra room that can be used as a media room, craft room, exercise room or office. Extras include beautifully maintained landscaping with an irrigation system, epoxy garage, new windows, fresh exterior and interior paint, new A/C, refrigerator and washer dryer. This is a move in ready home! Directions:Turn off of highway 14 North into Chestnut onto Chestnut hills Pkwy. Follow around until you reach Hawkins Way and turn right. First street you come to is Club course Dr. turn right and home is at the end of the cul-de-sac. Listing provided courtesy of Hammond Realty Group.